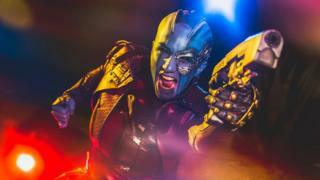 School teacher Amber Malinski is one of America's most dedicated cosplayers, and one of her favourite characters to portray is Scots actress Karen Gillan's Nebula in the Guardians of the Galaxy movies. Cosplay is described as a performance art that involves dressing up as a character from a book, film, television series, comic book or video game. The enthusiasts spend hours creating costumes for events such as comic conventions. 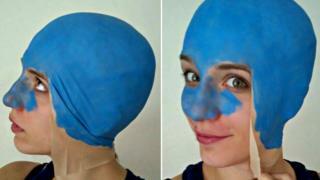 Malinski, 22, whose cosplay name is AmberSkies, decided to try her hand at recreating Gillan's Nebula after seeing the first Guardians of the Galaxy in 2014. The film is part of the sprawling Marvel comic and movie franchise and stars Chris Pratt, Zoe Saldana, Bradley Cooper, Inverness-born Gillan and others as a motley crew of space pirates and aliens. The first Guardians movie was followed by this year's Guardians of the Galaxy Vol. 2. Malinski, from Phoenix, Arizona, says: "Upon seeing Nebula on the big screen for the first time, it was her character design that appealed to me most. "I saw her and I got goosebumps and knew that she was amazing right away. "She is sleek, robotic, beautiful, yet tortured and so very angsty which is always so much fun to portray." She adds: "On top of cosplay, I'm also an actor and I've always been drawn to villains and darker characters, and Karen Gillan in the first movie played her part so expertly despite only having limited screen time. "You wanted to know more about Nebula, you knew there was a lot more to her story than meets the eye, and I knew I had to become her and find out just what that was." Malinski makes all her own props and special effects and taught herself movie make-up techniques. But with Nebula, there was one big major challenge. "Her baldness," says Malinski. "The polar opposite of how I look." 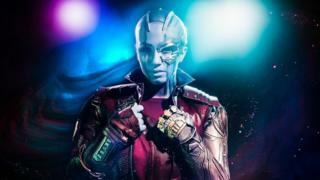 Gillan shaved her head for the first Guardians film, but used make-up and other film techniques in the sequel. Malinski said: "I have waist-length blonde hair that I have to shove up into a bald cap application, and since I'm no professional - it's a learning experience every single time. 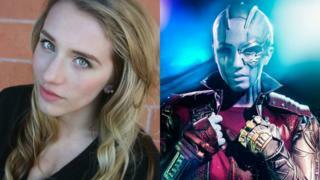 "Originally when I first started my journey with Nebula a few years ago, when the first Guardians of the Galaxy movie came out, the make-up process took a staggering six hours from start to finish. "All of my make-up is hand-painted, hand-shaded, and hand line-worked with the help of my dad who helps with the back of my head and areas I can't see. 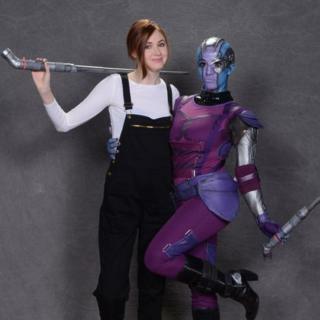 "Nebula's design in the first movie had a sleeveless top, which means that I also had to paint one of my arms and both hands blue in addition to all of the facial and head painting going on." She adds: "Thankfully over time as my skills have improved, and with each trial and error application, that time has been cut down to about three hours." Malinski has met Gillan at events in the US over the years. However, she worried the actress would not remember her at an event celebrating the release of Guardians of the Galaxy Vol. 2. Malinski says: "I started off with 'hellos' and 'I'm not sure if you remember me - but we met before' to which she replied 'Of course I remember. You always make such amazing cosplays'." "My little nerd heart was so happy I truly could burst." She adds: "Karen and the films' director James Gunn have even tweeted about me on a few occasions which is enough to send happy shivers down any fan's spine to be acknowledged by the actors and directors of the franchise you adore so much." While Gillan and Gunn have seen Malinski in her full Nebula get-up, have the children she teaches? "As much as I want to say 'yes' because that sounds amazing to freak them out like that, no I have not taken Nebula to my elementary school for the kids to see," she says. "I have definitely shown up to school in some pretty ridiculous outfits, wigs, and looks to add to the fun of whatever we may be learning at the time, but sadly no homicidal cybernetic aliens just yet."